Was flipping around the TV on saturday night and landed on a program detailing what happened within the twin towers on Spetember 11. And there, leading a group of people around one of the towers was William Hope. Program was called: Within the twin towers. It's probably an older program as they have a tendency to repeat these types of shows around tghis time of year. I'm sure I saw him in an episode of Bonekickers recently here in the UK. The Hero (you the player) is voiced by William Hope. He playes a character called Ion Battler. I have no footage of the speaking bits but here is some footage of the game itself. More footage of a huge spacestation. Post subject: Re: Gorman spotting! Sorry for the necropost, but I saw him in "The Marksman" last night.. I'd woken up at some point, turned on the tv for a minute & there he was as "Johnathan Tensor", trying to find out wth Wesley Snipes was up to..
That's what this thread is for, recording ALL sightings of this wonderful actor! Post subject: More Pulse Rifle spotting! Post subject: Sigourney Weaver in "Alienses"
Post subject: Re: Sigourney Weaver in "Alienses"
Have you got a non-hulu link or a way to bypass the friggin geo filter? Give that a whirl, it might just work for you. Now I can watch loads of US TV stuff without waiting for the download to finish. I liked the episode. Thankfully they didn't have some of their more untalented cast members too much in the limelight (Kristen Wiig I'm talking to you) and let the Sigourney have some really good skits. I for one cannot wait for "James Cameron's Laser Cats 5". There's an advert in the UK now for Actimel; it features a couple going out in the back garden in the snow and having a barbecue, presumably because they feel so healthy or something. I think the husband (silver hair) is Jay Benedict. Yup it's him. The advert has been on UK tv for a few months now! I just that advert and realised your right!! Saw him in Sherlock Holmes tonight, playing a flaming good character. Gets a bit 'Frosty' does he? 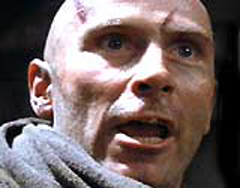 So for those who might find this obscure- "Morse" was one of the inmates in Alien3 (the one who survives at the end and gets taken away by the WY commandos... giving them a defiant F.U. ). Morse was played by Danny Webb. And I think- Say... that guy kinda looks like the guy who played Morse! I check out the Wiki page on Danny Webb- turns out I was right! Post subject: Re: "Morse" Spotting! haha what an obscure find! i like it. Hes been in a lot ofd British TV shows and bit parts in films. Hes played everything from soldiers to corporate sleeze bags. Hes quite a prolific actor. Oolite homepage: http://www.oolite.org/ Totally free game. Nice! Post subject: Re: Hudson Spotting. I just spent the last few months larking about with Freelancer and really enjoyed it, so I might give this one a go.